This book was first published by Victor Gollancz in 1978, and both text and illustrations hold up perfectly today. Michael Foreman’s full-colour plates and monochrome drawings are lively and attractive, and they are well-suited to a text that remains a high point in translation of the Grimms. Most notably, Brian Alderson took the brave decision to translate two texts given by the Grimms in North German dialect into a gentle, easily understandable Yorkshire burr. The stories in question are The Fisherman and His Wife and The Juniper Tree, both collected by the painter Philipp Otto Runge, and packed with vivid painterly detail: ‘And when he came to the sea, the sea was all black and grey and the water all seething and stank real foul’; ‘she was real horrid to the little lad, shoving him around from one corner to another, biffing him here, cuffing him there, so that the poor child lived in fear.’ Thirty-one stories are included, many chosen with an eye to humour, so that darker tales such as Rapunzel are balanced with comic delights such as Lazy ‘Arry, Sunny Jim, and Skinny Lizzie. 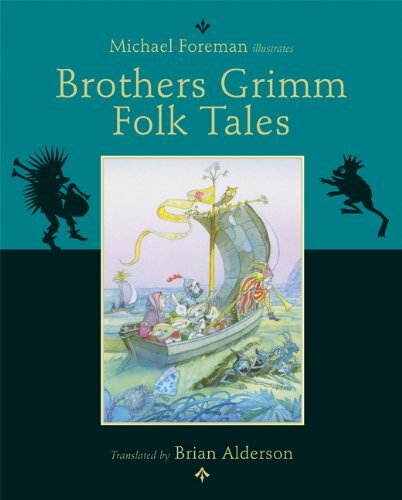 Brian Alderson provides a new afterword to this edition, explaining his wish ‘to make the stories sound as though they were folktales told in a natural English by an English storyteller’; this aim is amply achieved in a volume that is a delight from start to finish.